There are nine members of the Board of Regents (Board), each of whom is appointed by the Governor subject to confirmation by the Senate. By law, one member shall be appointed from each Congressional district with the remaining members appointed at large. No more than five Regents may be of the same political party, no two members shall reside in the same county at the time of appointment. These and other qualifications may be found in Article 6, Section 3 of the Kansas Constitution and K.S.A. 74-3202a. Terms are staggered and are for a period of four years each, expiring on June 30, except that a member shall continue to serve until a successor is appointed and confirmed as provided in K.S.A. 74-3202a. Pursuant to Kansas law, each member of the Board shall receive compensation, subsistence allowances, mileage and other expenses as authorized pursuant to K.S.A. 74-3202a, 75-3212 and appropriations provisos. The duty of loyalty requires Board members to exercise their powers and duties in the interests of the Board and its institutions as a system, and not in the Board member’s own interest or in the interest of another person, an individual institution or other organization. A conflict of interest occurs when there is a divergence between a Board member’s private, personal relationships or interests, or commitments to a state university or other entity, and the Board member’s obligations to the Board. An apparent conflict of interest occurs when an independent observer might reasonably question whether actions or decisions made by a Board member on matters before the Board appear to be determined by considerations of personal benefit, gain or advantage, or some interest other than what is best for the Board. Such interests may include, but are not limited to, employment with, ownership of or service on the board of directors of an organization that has or may have relationships with the Board or institutions governed, coordinated or regulated by the Board. A conflict of interest or the appearance of a conflict of interest depends on the situation, and not necessarily on the character or actions of the individual. The Board of Regents acknowledges that integrity, accountability, and openness of financial relationships and other relevant interests are essential to responsible and credible administration of the State of Kansas system of higher education. A process for disclosing and considering potential conflicts, and managing any actual conflicts, enhances transparency and confidence in the Board’s actions. (b) If, however, involvement by the Board member would bring compelling benefit to the institution, the Board may approve such involvement subject to any conditions the Board deems appropriate to assure both propriety and the appearance of propriety. (3) Identified Board member conflicts shall be reviewed by the Board annually at the September meeting. (4) Statements of Substantial Interest. All members of the Board shall file a written statement of substantial interest pursuant to K.S.A. 46-247 et seq. regarding any substantial interests within the meaning of K.S.A. 46-229 that each member may hold. (1) When any matter comes before the Board for discussion or action and a Board member is determined, in accordance with the above, to have an actual or apparent conflict in the matter, the Board member with the conflict shall not vote on the matter. (2) When any matter comes before the Board for discussion or action and a Board member is determined, in accordance with the above, to have an actual or apparent conflict in the matter, the conflicted Board member shall not participate in or attend Board discussion of the matter, unless the Board determines that it would significantly serve the interest of the Board to have the conflicted Board member explain the issue or answer questions. Any such determination and participation shall be recorded in the Board minutes. iii. No Private Inurement. No part of the funds of the Board or any state university shall inure to the benefit of, or be distributed to, any member of the Board, except that the Board and the state universities may make reasonable payments for expenses incurred on their behalf relating to any of their lawful purposes. The Board shall be authorized and empowered to pay Board members reasonable compensation for services rendered to or for its benefit relating to any of its lawful purposes, in accordance with subsection 1.c. of this section A.
iv. Board members shall comply with the governmental ethics laws relating to solicitation or acceptance of gifts, meals, transportation or tickets/access to sporting events and other entertainment or activities as set forth at K.S.A. 46-237 and 46-237a. The Board is created by Article 6 of the Kansas Constitution and is empowered by the Legislature. 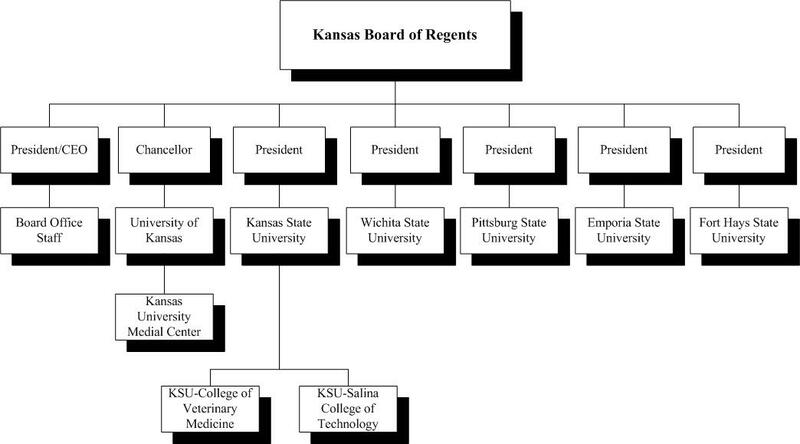 It is responsible for the control, supervision, and operation of the state universities in Kansas as shown below, as well as the coordination and supervision of the public community colleges and technical colleges in Kansas and the regulation of private and out-of-state higher education institutions operating in Kansas. The Board of Regents is a policy making as opposed to an administrative body. It is bi-partisan by law and non political by tradition. Just as the Kansas institutions of higher education should not be subjected to political pressures, so should the Board be protected against political pressures. 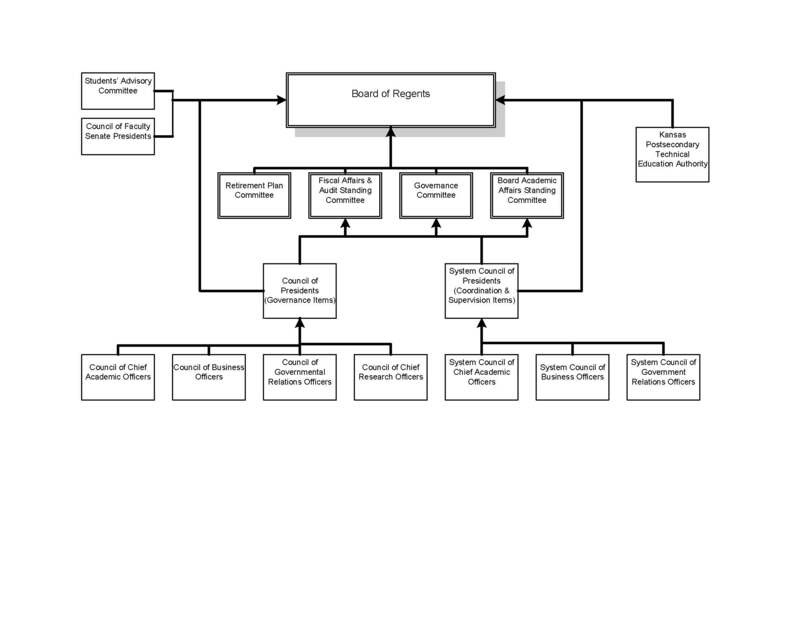 The constitutional and statutory role of the Board of Regents varies for different higher education institutions. (4) Developing policy on a wide range of institutional issues. All policies and procedures adopted by any state university, whether or not such policy or procedure requires Board approval, shall be in conformity with the policies and procedures of the Board and the laws of the State of Kansas and the United States. (3) Facilitating mergers and other consolidation activities. The Board of Regents has established a structure of councils and committees through which most proposals initiated by an institution or sector shall be vetted before a recommendation is made to the Board. The formal structure through which a typical proposal will progress is illustrated in the flow chart shown below. As a general rule, individuals and groups who are directly affected by a proposal, or have a vested interest in a proposal, shall be given an opportunity to review and provide advice about the proposal prior to its final adoption. This ensures that all perspectives on a concept have been considered in the review and approval process. For proposals that clearly have system-wide impact, council leaders shall ensure system participation in the development process. Review and action by higher-ranking bodies is facilitated by meaningful involvement by affected parties at the initial stages of development. While there may be justifiable exceptions, most proposals shall be developed primarily by those persons who are likely to be responsible for implementation, and appropriate councils, committees, or task forces shall develop or review proposals that are intended for action by Board standing committees and/or the Board (or the President and Chief Executive Officer, as applicable). Councils, committees, task forces and other such groups do not have authority to prevent further review of a proposal by other councils, committees, or Board Committees. In the context of this policy, “system-wide” means those proposals that may impact many or all of the institutions having a reporting relationship to the Kansas Board of Regents. If it is uncertain whether a proposal is system-wide or non system-wide in impact, the President and Chief Executive Officer will decide the issue. Participants in the review process shall make every reasonable effort to facilitate review and action on proposals. Timeliness and responsiveness to serve students and employers is a system-wide value. i. During the Board’s regular monthly meeting, Board Standing Committees meet to consider matters relating to academic affairs, fiscal affairs, facilities, and policy and procedure. Reports of the recommendations of the Standing Committees with respect to each of these areas are then presented to the Board for final action. ii. The Chairperson may also appoint, subject to Board approval, special committees to assist the Board in fulfilling its functions, and may, subject to Board approval, appoint individual Regents to statewide boards or commissions when called upon to do so. In addition, at its regular meeting in September, the Board annually elects one of its members to serve on the Washburn University Board of Regents for the ensuing calendar year. (1) The Retirement Plan Committee, established in 2005, is responsible for issues related to the Board’s retirement plan, including oversight of plan investments and administration. The Committee reports directly to the Board. The issues the Committee will consider may be directed by the Board, may arise from the Board’s fiduciary duties, or may be initiated by the Retirement Plan Committee itself. (2) The Retirement Plan Committee members will be appointed by the Board and will include one member of the Board; one member of the Council of Presidents, or designee; two members of the Council of Business Officers; three state university human resource directors; and two individuals nominated from the state universities who are experts in the subject matter of investments and retirement planning. A staff person from the Board of Regents office who is appointed by the President and Chief Executive Officer will serve as a non-voting ex officio member. The chairperson of the Committee will be the appointed Board member. When appointing Retirement Plan Committee members, the Board shall strive for as broad of representation from the state universities as possible. (3) Members will have staggered three year terms and may resign at any time, effective when tendered to the Board. A person who is appointed to replace a member who has resigned will serve out the remainder of the term of the resigning member. i. The Council of Presidents, established in 1963, consists of the chief executive officers of the state universities. The Board's President and Chief Executive Officer serves as an ex officio member of the Council. The chair is rotated annually on July 1st. ii. The Council of Presidents’ main function is to consider subjects of significance to the state university sector, either at the request of the Board or the Board’s President and Chief Executive Officer, or on the Council of Presidents’ own initiative, report to the Board when called upon to do so, and make recommendations to the Board on general policy affecting all state universities. The Council of Presidents may create permanent or ad hoc committees, composed of campus or non campus personnel, to study selected subjects and report back to the Council. iii. Meetings of the Council of Presidents are held in conjunction with the regular meetings of the Board, and at such other times as the chair of the Council deems necessary. (a) The Council of Chief Academic Officers, established in 1969, is composed of the academic vice presidents of the state universities. The Board's Vice President for Academic Affairs serves as an ex officio member, and the member from the same institution as the chairperson of the Council of Presidents serves as chairperson of the Council of Chief Academic Officers. The chief academic officers of the University of Kansas Medical Center and Washburn University are authorized to participate as non voting members when agenda items affecting those institutions are to be considered. The Council of Chief Academic Officers meets monthly and reports to the Council of Presidents. (b) The Council of Chief Academic Officers works with the Board Academic Affairs Committee through the Vice President for Academic Affairs. One of its primary functions is to outline the academic plan for the state university system. It has responsibility for continuous planning and for upgrading the Master Plan as circumstances dictate, and for carrying out the procedures outlined in the Board's policy for Approval of New Programs. (a) The Council of Business Officers, formed in 1969, consists of the chief business officer of each state university and reports to the Council of Presidents. The chairperson is from the same institution as the chair of the Council of Presidents, and the Vice President for Finance and Administration for the Board serves as an ex officio member. The chief business officer of the University of Kansas Medical Center is authorized to participate as a non voting member when agenda items affecting that institution are to be considered. (b) The Council of Business Officers’ official function is to consider matters on which it can advise the Council of Presidents, either at the request of the Council of Presidents or on the Council of Business Officers’ own initiative. The Council meets monthly to discuss various issues arising from state regulatory bodies, statutes and regulations, work out mutual solutions to administrative problems, and develop uniform systems of accounting, budgeting and reporting. (a) The Working Group of Title IX Coordinators consists of the Title IX coordinator designated by each state university and reports to the Council of Presidents. The chairperson of this Working Group shall be from the same institution as the chair of the Council of Presidents. The Title IX coordinator of the University of Kansas Medical Center is authorized to participate as a non-voting member. (ii) share information, experiences and expertise in order to foster more robust operations and consistency in the functions performed by all Title IX coordinators across the state university system. (c) The Working Group shall meet quarterly to discuss various issues arising from state and federal regulatory bodies, statutes and regulations, and recommend to the Council of Presidents suggested strategies and solutions to issues related to Title IX compliance. The Council of Faculty Senate Presidents consists of the duly elected Faculty or University Senate President or chairperson from each state university and the Kansas University Medical Center. The function of the Council of Faculty Senate Presidents is to address faculty concerns in a focused and efficient manner. The chairperson is from the same institution as the chair of the Council of Presidents. i. The Students' Advisory Committee, established by K.S.A. 74-3229 in 1975, consists of the student body president from each state university. The members of the Students’ Advisory Committee serve for terms expiring concurrently with their terms as elective student officers and upon qualification of their successors. The chief executive officer of each state university shall annually certify to the Board the name of the highest student executive officer elected by the entire student body of that state university. ii. The statutory duties and functions of the Students’ Advisory Committee include attendance at meetings of the Board of Regents; making recommen¬dations to the Board concerning course and curriculum planning and faculty evaluations; advising the Board on the formulation of policy decisions on student affairs; identifying student concerns; considering any problems presented to it by the Board and giving advice thereon; disseminating information to the members' peers concerning the philosophies and standards of education developed by the Board; and stimulating awareness of student rights and responsibilities. iii. The chair of Students’ Advisory Committee, appointed by the Committee pursuant to its own internal processes, may request the President and Chief Executive Officer to place items on the Board's agenda for discussion and/or consideration. The President and Chief Executive Officer shall review the Committee’s request with the Chair of the Board prior to responding to the Committee. iv. When the Board creates task forces or other subordinate organizations for the purpose of studying questions related to the duties and responsibilities of the Students’ Advisory Committee, a representative of the Committee shall be appointed to such task force. Further, all councils comprised of state university personnel are encouraged to give consideration to the inclusion of student representation on task forces and other bodies created to deal with issues related to the interests and responsibilities of the Students’ Advisory Committee. i. The Council of Government Relations Officers, established in 2011, consists of the director of government relations for the Board and the government relations officer (i.e. legislative liaison) of each state university. The Council reports to both the Council of Presidents and the Board President and Chief Executive Officer. Two members of the Council will serve as co-chairpersons: One shall be from the same institution as the chair of the Council of Presidents, and the other shall be the director of government relations for the Board. ii. The Council of Government Relations Officers’ official function is to advise the Council of Presidents and the Board President and Chief Executive Officer, as well as the Board, on matters relating to pending or proposed legislation and on matters related to government relations generally. The Council meets monthly during the months of September through June with an annual retreat, and on a weekly or as-needed basis during the legislative session. The University Support Staff Council consists of the duly elected representatives from the University Support Staff Council at each of the state universities and the University of Kansas Medical Center. The role of the University Support Staff Council is to advise the Board of Regents regarding matters relating to university support staff issues and concerns. The general expectation is that the University Support Staff Council reports to the Board shall be made during the Board’s September and January meetings. The University Support Staff Council chair shall be from the same institution as the chair of the Council of Presidents. The Unclassified Staff Council consists of the duly designated representatives from the unclassified professional staff ranks at each of the state universities and the University of Kansas Medical Center. Because a formally designated unclassified staff organization does not exist at all the universities, each institution shall determine how its representative to the Council will be selected. The role of the Unclassified Staff Council is to advise the Board of Regents regarding matters relating to unclassified staff issues and concerns. The general expectation is that Unclassified Staff Council reports to the Board shall be made during the Board’s September and January meetings. The Unclassified Staff Council’s chair shall be from the same institution as the chair of the Council of Presidents. As a general rule, committee and council chairs will rotate annually on July 1 in the following sequence: University of Kansas, Kansas State University, Pittsburg State University, Emporia State University, Wichita State University, and Fort Hays State University. Whenever rotation in such manner is impossible for a given committee or council, a chair shall be selected by general election of the members. i. The System Council of Presidents, established in 2002, consists of the six presidents of the state universities, four presidents selected by the nineteen community colleges, one president selected by the six technical colleges, and the president of Washburn University. The Board’s President and Chief Executive Officer serves as an ex officio member of the Council. Two members of the System Council of Presidents will serve as co-chairpersons: One shall be by annual rotation on July 1st from among the six state universities, the other shall be selected by the six Council members from institutions coordinated-but-not-governed by the Board. The presidents of other institutions (when not current members) are invited to provide input to System Council of Presidents when agenda items affecting those institutions are to be considered. On matters that have system-wide impact, all positions will be reported to the Board, and a majority will be required for Council endorsement. ii. The System Council of Presidents’ main function is to consider coordination issues, either at the request of the Board or the Board’s President and Chief Executive Officer, or on the System Council of Presidents’ own initiative, report to the Board when called upon to do so, and make recommendations to the Board on general policy affecting the system as a whole. The Board President and Chief Executive Officer will determine which issues are coordination issues; the Board Chairperson may review this determination. The System Council of Presidents may create permanent or ad hoc committees, composed of campus or non-campus personnel, to study selected subjects and report back to the Council. iii. Meetings of the System Council of Presidents are held in conjunction with the regular meetings of the Board, and at such other times as the co-chairpersons of the Council deem necessary. (a) The System Council of Chief Academic Officers, established in 2002, is composed of the six chief academic officers of the state universities, four chief academic officers selected by the nineteen community colleges, one chief academic officer selected by the six technical colleges, and the chief academic officer of Washburn University. The Board’s Vice-President for Academic Affairs serves as an ex officio member. Two members of the System Council of Chief Academic Officers will serve as co-chairpersons: One shall be from the same institution as the state university System Council of Presidents co-chairperson; the other shall be selected by the six Council members from institutions coordinated-but-not-governed by the Board. The chief academic officers of the University of Kansas Medical Center and other institutions (when not current members) are invited to provide input to the System Council of Chief Academic Officers when agenda items affecting those institutions are to be considered. The System Council of Chief Academic Officers may solicit input from councils that are not established by the Board. The System Council of Chief Academic Officers meets monthly and reports to the System Council of Presidents on matters that have system-wide impact; on such matters all positions will be reported, and a majority will be required for Council endorsement. (b) The System Council of Chief Academic Officers formulates recommendations relating to the implementation of the Higher Education Coordination Act (L. 1999, ch. 147) as they apply to academic affairs; addresses instructional, academic, or related issues that affect higher education system-wide in Kansas; receives and reviews recommendations from individual campuses or instructional groups; promotes continuous quality improvement and coordination of higher education in Kansas; and promotes higher education improvement through joint academic or professional development activities. One of its primary functions is continuous academic planning for the Kansas public postsecondary system. It acts in accordance with the academic affairs policies and procedures for coordination as outlined in the Board’s Policy and Procedure Manual. (a) The System Council of Business Officers, established in 2007, consists of the six chief business officers of the state universities, four chief business officers selected by the nineteen community colleges, one chief business officer selected by the six technical colleges, and the chief business officer of Washburn University. The Board’s Vice-President for Finance and Administration serves as an ex officio member. Two members of the System Council of Business Officers will serve as co-chairpersons: One shall be from the same institution as the state university System Council of Presidents co-chairperson; the other shall be selected by the six Council members from institutions coordinated-but-not-governed by the Board. The chief business officers of other institutions (when not current members) shall be invited to provide input to the System Council of Business Officers when agenda items affecting those institutions are to be considered. The System Council of Business Officers meets as needed on the call of a co-chairperson and reports to the System Council of Presidents on matters that have system-wide impact. All positions will be reported to the System Council of Presidents, and a majority will be required for System Council of Business Officers’ endorsement. (b) The System Council of Business Officers formulates recommendations relating to the implementation of the Higher Education Coordination Act (L. 1999, ch. 147) as they apply to fiscal affairs and administration and considers system financial and business matters on which it can advise the System Council of Presidents, either at the request of the System Council of Presidents or on the System Council of Business Officers own initiative. One of its primary functions is to study and make recommendations regarding the unified budget for state funding of postsecondary educational institutions. (a) The System Council of Government Relations Officers, established in 2011, consists of the government relations officer (i.e. legislative liaison) of each of the state universities, up to four government relations officers (i.e. legislative liaisons) selected by the nineteen community colleges (one of whom may be the Executive Director of the Kansas Association of Community Colleges), one government relations officer (i.e. legislative liaison) selected by the six technical colleges (which may be the Executive Director of the Kansas Association of Technical Colleges), and the governmental relations officer (i.e. legislative liaison) for Washburn University. The Board’s Director of Government Relations and Communications serves as an ex officio member. Two members of the System Council of Government Relations Officers will serve as co-chairpersons: One shall be from the same institution as the state university System Council of Presidents co-chairperson; the other shall be selected by and from the non-state university System Council of Government Relations Officers members. The System Council of Government Relations Officers meets quarterly, or as needed on the call of a co-chairperson, and reports to the System Council of Presidents on matters that have a system-wide impact. All positions will be reported to the System Council of Presidents, and a majority will be required for System Council of Government Relations Officers’ endorsement. (b) The System Council of Government Relations Officers formulates recommendations relating to pending or proposed legislation and on matters related to government relations generally. a. Communications relating to policy and administrative matters are to be directed to the Board from each campus through the Chancellor or President of the respective institution. However, any group may petition the Board in writing through the President and Chief Executive Officer of the Board. b. All official communications pertaining to institution or Board activities or responsibilities between campus officials and Board members shall be copied to the President and Chief Executive Officer of the Board. a. State university chief executive officers shall send agenda items to the President and Chief Executive Officer of the Board as early as needed to meet the Board notification deadlines. If no items are to be presented, the Board President and Chief Executive Officer shall be so notified. b. No publicity or news release shall be given on any item that requires Board action until after such matter has been presented to the Board. c. The agenda is printed seven days prior to the Board meeting. All items to be considered on the agenda should be received before its printing. A member of the Board of Regents may submit items for consideration at any time. d. The President and Chief Executive Officer is authorized to accept supplementary agenda items of a critical nature which have developed as a result of unusual circumstances as late as 12 Noon of the day preceding the regularly scheduled Board meeting. Such items shall be in written form with sufficient copies for distribution to the Board members prior to the regular meeting. The Kansas Board of Regents may include on its meeting agenda a time for members of the public to address the Board. The Board Chair shall determine if the item is to be placed on the agenda of a meeting. The Chair has the discretion and authority to direct and limit the presentation of public comment. a. Copies of the Minutes of each Board meeting shall be prepared by the President and Chief Executive Officer after each meeting and sent to all those entitled to copies. Copies of the minutes are filed in the main library at each of the state universities and are available there for public inspection. Electronic copies of the minutes from a number of years may be accessed by clicking here. The Official Minutes of the Board are also on file in the Board Office in Topeka and are open for inspection. b. Actions taken or approvals given by Board staff on behalf of the Board pursuant to authority officially delegated by the Board shall be properly documented, and such documentation shall be retained at the Board office in accordance with applicable record retention schedules. The President and Chief Executive Officer performs those duties delineated in Article IV, Section 2 of the Board By Laws and restated below, maintains the principal office of the Board in Topeka, employs such other persons as needed for positions authorized by the Board, and supervises the activities of all employees of the Board office. The President and Chief Executive Officer is appointed by the Board and serves at its pleasure. By statute it is the duty of the Board President and Chief Executive Officer to attend all meetings of the Board of Regents, keep a full and correct record of its proceedings (which, when approved, shall be signed by the Chair of the Board), and perform such other duties as the Board may require. g. Employing such other professional and/or clerical employees as are required to carry out the administrative duties of the Board. At times when it is mutually beneficial, Board staff may be supplemented by staff from the state universities. Such persons will be designated “Staff Affiliates.” Salaries and travel expenses for Staff Affiliates will generally be paid by the institution, not from the Board budget. The Board will provide office space, furniture, computer system, communications, and incidental office expenses (e.g. photocopy, mailings, long distance phone). Staff Affiliates serve at the pleasure of the President and Chief Executive Officer with approval by the Board. i. All Board office staff members, both classified and unclassified, are subject to the same provi-sions for sick leave as those applicable to state civil service personnel, including but not limited to K.A.R. 1-9-5. Sick leave shall be scheduled and approval from the President and Chief Executive Officer, or designee, obtained in advance to the extent possible. Sick leave is forfeited upon termination of employment, if the employee is not retiring or is not retirement-eligible, but may be reinstated if the employee returns within one year to a regular position with a State of Kansas agency. Sick leave will be paid at retirement or when the employee separates from service and is retirement eligible if the employee has accrued a minimum of 800 sick leave hours. ii. Unclassified Board office staff in regular positions shall accrue annual leave in accordance with this provision. Full-time, exempt unclassified Board office staff members shall accrue one day of annual leave each pay-period, not to exceed twenty-two days (176 hours) per fiscal year. Part-time, exempt, unclassified Board office staff shall accrue pro-rated annual leave based upon their FTE. Full- and part-time non-exempt unclassified Board office staff shall accrue annual leave based on hours paid in the pay period. Unclassified Board office staff members may accumulate a maximum of thirty-eight working days (304 hours) of annual leave; provided, however, that no employee may receive, upon termination, payment for more than twenty-two days (176 hours) of annual leave; and upon retirement, or when retirement eligible, payment for more than thirty days (240 hours) of annual leave. iii. Each classified Board office staff member in a regular position shall accrue annual leave in accordance with K.A.R. 1-9-4.
iv. Official state holidays and any special holidays declared by the Governor are not counted as days of annual leave. v. Annual leave shall be scheduled in advance and granted by the President and Chief Executive Officer, or designee, for periods of time requested by the staff member subject to the operational needs of the Board office. Annual leave requested as a result of personal or family emergency shall be treated on an individual basis by the President and Chief Executive Officer. vi. Board office staff members in regular positions may be granted leave with pay upon the death of a close relative. Such leave shall in no case exceed six working days. The employee's relationship to the deceased and necessary travel time shall be among the factors considered in determining whether to grant bereavement leave, and, if so, the amount of leave to be granted. vii. Unclassified Board office staff members who accumulate sick leave shall be eligible to participate in the shared leave program of the State of Kansas in the same manner as unclassified staff at the state universities. Classified Board office staff members in regular positions who accumulate sick leave are eligible to participate in the shared leave program of the State of Kansas as provided in K.A.R. 1-9-23. The Board office shall adopt, as part of its employee policies and procedures, appropriate limitations and qualifications for accumulation and use of shared leave. i. Eligible classified Board staff members are covered by the Kansas Public Employees Retirement System as determined by law. ii. Unclassified Board office staff members are covered by and/or eligible for those retirement benefits which are set forth in detail under the heading of CHIEF EXECUTIVE OFFICER, FACULTY AND STAFF, Retirement. iii. Eligible classified and unclassified Board office staff members may participate in the 403(b) voluntary retirement plan. The provisions of the Kansas Board of Regents Voluntary Plan Document shall control the terms of the plan. iv. Eligible classified and unclassified Board office staff members may participate in the State of Kansas 457 deferred compensation plan. v. The State of Kansas provides group health, life and long-term disability insurance and other voluntary benefit programs to eligible classified and unclassified employees. The provisions set forth under the heading of CHIEF EXECUTIVE OFFICER, FACULTY AND STAFF, Commitment of Time, Conflict of Interest, Consulting and Other Employment shall be applicable to the unclassified staff of the Board. The President and Chief Executive Officer may establish rules and procedures to effectuate this policy. Approval of out-of-state travel requests for staff other than the President and Chief Executive Officer of the Board is vested in the President and Chief Executive Officer. Requests for such travel should be as directed by the President and Chief Executive Officer and expenses will be allowed pursuant to Department of Administration regulations on travel. Approval of out-of-state travel request for the President and Chief Executive Officer is vested in the Board. Requests for such travel should be submitted as directed by the Board and expenses will be allowed pursuant to Department of Administration regulations on travel. The provisions set forth under the heading of CHIEF EXECUTIVE OFFICER, FACULTY AND STAFF, Appointments, Criminal Background Checks shall apply to staff hired for the Board office. The President and Chief Executive Officer may establish rules and procedures to effectuate this policy. a. The Board may enter into contracts, including leases of personal property, with any party or par¬ties including any agency of the United States or any state or any subdivision of any state or with any person, partnership or corporation if the pur¬pose of such contract is related to the operation or function of the Board. (K.S.A. 76 721). b. Contracts entered into on behalf of the Board of Regents shall be executed by the Chair of the Board, or the Board’s President and Chief Executive Officer, or anyone other¬wise authorized by direct action of the Board. iii. may appoint appropriate staff to act as designated record custodians and/or the designated “freedom of information officer,” as set forth and defined by K.S.A. 45-215 et seq. b. Public records may be inspected during normal business hours of the Board of Regents Office which are between 8:00 a.m. and 5:00 p.m. Monday through Friday (except holidays and other non-work days authorized by the state). c. The Board’s President and Chief Executive Officer may establish record fees that reflect and are designed to recoup the actual costs of providing copies of or access to public records.